Each year, the Northwest Asian Weekly sends a team of intrepid film reviewers to the Seattle International Film Festival to pick out the best Asian and Asian American films. Starting this week and running through the end of May, we will be reviewing our picks for the most interesting APA films at this year’s SIFF. 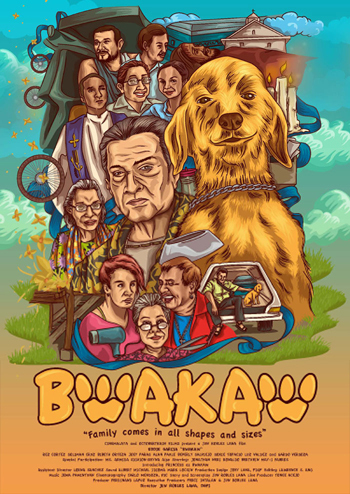 An old miser awaiting death is brought back into the world of the living by a stray dog, Bwakaw, which follows him everywhere in this film set in the Philippines. The main character, Rene (played by veteran Filipino actor Eddie Garcia), is a retired postal worker that is surly, insulting, and without any expectations for the future of his life. So focused on his death, Rene has packaged up his possessions in preparing to send to those he has bequeathed in his will. He also takes advantage of a funeral home’s “Summer Sale” to purchase a coffin. The catch is that since he had not passed on, he has to take the coffin home. Rene actually tests the coffin — even using it as a bed. It becomes a source of one of the funnier moments of the movie when his friends come in for an unexpected visit. Although Rene tries to lead a life of a shut-in, he has friends that continue to gravitate toward him, including his postal worker friends, a stylist at a salon he frequents, and a taxi driver named Sol. Rene finds Sol as a surprising source of friendship as he helps him when Bwakaw suddenly becomes ill. It’s this friendship that finds Rene reevaluating whether he should look forward to death or embrace living in the moment. It is revealed that Rene is gay, though he did not come out until it was “too late” in life. His sexuality is one of the reasons for his mixed feelings about Sol and his initial reasons for detaching himself from the rest of society. Garcia is excellent as Rene, a man that must find a way to seek help from friends despite pushing them away with his behavior. We see him grapple with his sexuality and his own choices in life during the movie. While it is billed as a dramedy, Bwakaw is more of a dramatic piece with comedic moments spliced throughout the film. The movie is about life and the unintended relationships that happen during it. And, if you are an animal lover, Bwakaw will pull at your heartstrings. “Warning: this film contains explicit scenes that some viewers may find offensive,” reads a disclaimer at the end of this film’s SIFF synopsis. And indeed, with its vividly rude and grimy portrait of a thug, this latest film from controversial South Korean director Ki-duk Kim may lose a few people along the way — or even before the curtain goes up. Jung-jin Lee stars as Kang-do, a debt collector for underworld loan sharks. When the hapless borrowers discover that they can’t pay the outrageous interest charges, Kang-do gives them an “out,” which involves agreeing to self-mutilate, and Kang-do will pocket the insurance settlement. It sounds off-the-wall, but in director Kim’s portrait of South Korea, a lot of people grab cabbage first and ask questions later. These mutilation scenes often involve heavy machinery, and while they aren’t as blood squirting as they could be, they get the point across. This film is not for sensitive sensibilities. Kang-do, taller than most Koreans, with a careful coif, a swagger, and a seemingly implanted sneer, is not someone you’d want to see anywhere, much less coming to collect what you owe. For more information, a full schedule, directions, and ticket buying information, visit www.siff.net. Northwest Asian Weekly staff can be contacted at info@nwasianweekly.com.